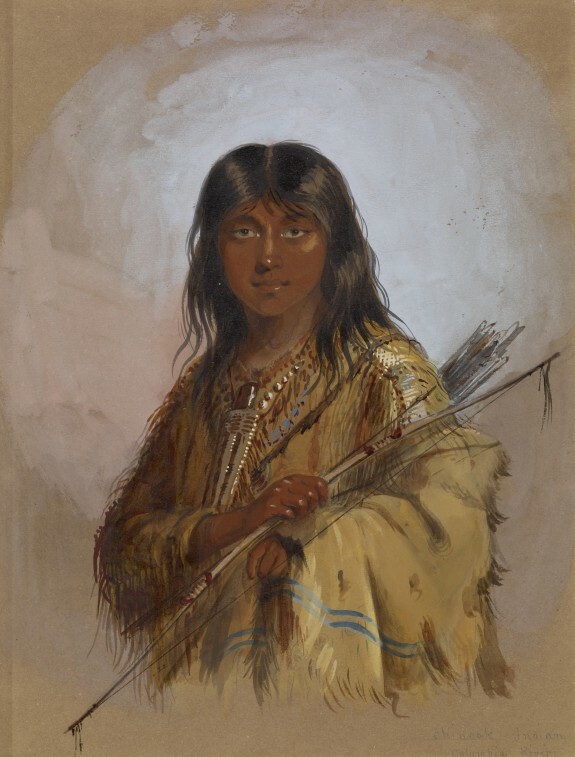 Description It was probably the "Asiatic type, the eyes being almond shaped and slightly turned up at the corners," that attracted Miller to paint this Chinook Indian portrait. He was a "favorable specimen, about 22 years of age," and holding a remarkable bow made of elk-horn with a sinew string, which Miller also drew. In July 1858 William T. Walters commissioned 200 watercolors at twelve dollars apiece from Baltimore born artist Alfred Jacob Miller. These paintings were each accompanied by a descriptive text, and were delivered in installments over the next twenty-one months and ultimately were bound in three albums. Transcriptions of field-sketches drawn during the 1837 expedition that Miller had undertaken to the annual fur-trader's rendezvous in the Green River Valley (in what is now western Wyoming), these watercolors are a unique record of the closing years of the western fur trade. Alfred Jacob Miller. The Walters Art Gallery, Baltimore. 1971. Alfred Jacob Miller: An Artist on the Oregon Trail. The Walters Art Gallery, Baltimore; Amon Carter Museum, Fort Worth; Buffalo Bill Historical Center, Cody. 1981-1982. Alfred Jacob Miller: Watercolors and Drawings. The Walters Art Gallery, Baltimore. 1984.